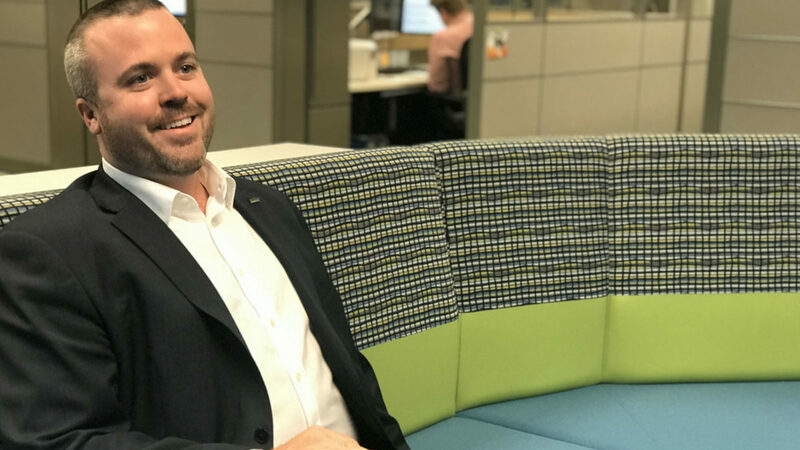 VP/Director of Information Security Risk Management Brandon Lloyd is the hiring manager for a new career opportunity at UMB: Senior Data Governance Analyst. The following stems from a Q&A session with Brandon about the role, his leadership style and his team. What is your philosophy for leading your team? I’ve learned from some of the best. My favorite managers always set clear expectations and held me accountable. I’m all about allowing the freedom to make mistakes and having honest conversations about learning from the process; this puts people in the best position to be successful. Describe the Sr. Data Governance Analyst role. What does that mean? Data governance helps make sure we have the right information, in the right hands, at the right time. The increasing number of initiatives across our business drove us to create a dedicated position to apply consistent standards for creating, maintaining and disposing data. This is a great opportunity for someone to learn different parts of UMB’s business and the types of data they use to achieve business goals and manage risks. 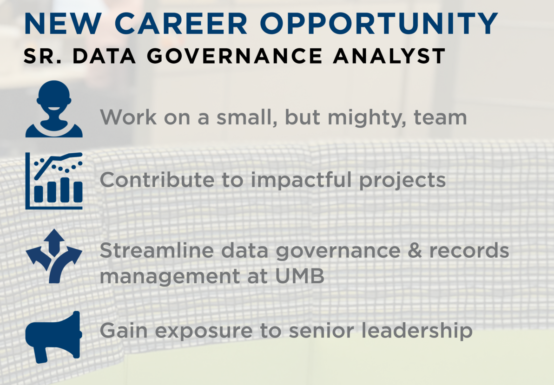 We’re excited for the Sr. Data Governance Analyst to make an impact on many activities already taking place at UMB and to provide ongoing assurance to leadership team and stakeholders, driving efficiency and working towards objectives. What’s great about your team? We’re a small and nimble bunch. We are make sure we are providing the right guidance across the entire company, but we’re small enough to work closely together. We get to know each other well—we can talk about what we’re doing for the weekend and how to solve a problem on a project. I love solving problems and I’ve had no shortage of opportunities to work on challenging and exciting projects at UMB. I love the folks I work with as we take on something new every day. I’ve had several different roles at UMB: sales, risk management, operations, product management. The consistent takeaway from my experience is the need for problem-solving and teamwork; it keeps me coming back for more. We’re always up to something fun and exciting. We’re all about servant leadership and being humble, but hungry. We have a lot of people who are on a mission to go solve problems—for our customers, our communities and for each other. Apply for the Sr. Data Governance Analyst role here. Not ready to apply? Become a UMB Insider to stay in touch.